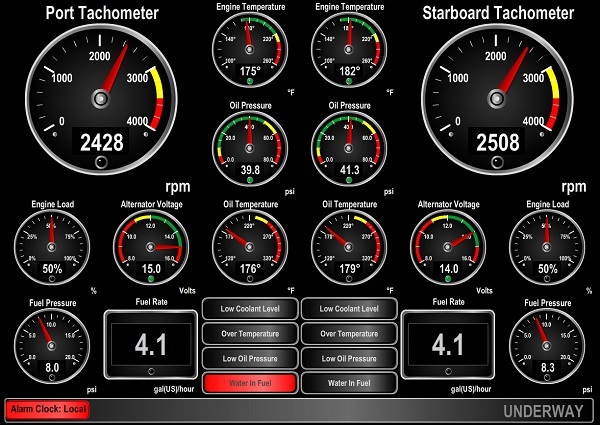 Whether you are interested in monitoring your vessel's systems while underway or remotely from your home or office, Maretron's N2KView® software displays the information you need including engines, generators, tanks, rudders, navigation instruments, local weather, and much, much more. N2KView® is completely user-configurable and you are free to create different screens for your exact needs while easily switching from screen to screen for monitoring all your systems. Digital displays, analog gauges, graphic displays, warning lights, and bar graphs, all can be configured exactly how you want them to be. You can even set the operating limits and color bands for analog gauges so you know when things are within limits and when they are not. N2KView® is a comprehensive vessel monitoring and control software that goes beyond simple monitoring. With N2KView® you get additional functionality including alerts, video, control, and fuel management. The alerts functionality allows you to setup as many warnings and alarms as you need so you can be forewarned of potential problems. With alerts, you can relax knowing that the system is watching for smoke, CO, high bilge water, or anything else you deem important. N2KView® video capability allows you to add cameras as part of the monitoring system - for example a camera in the engine room - or the cameras can be used as part of the security system. The control functionality gives you the ability to manage your electrical system; for example, you can turn lights or pumps on or off directly from N2KView® and even tell if the lights or pumps are burned out and not working. Lastly, the fuel management function uses information from the fuel flow monitor, tank monitors, and GPS to provide advanced information like distance and time to empty as well as fuel rate and fuel economy. N2KView® software can run on your vessel's computer or on standalone products like the Maretron's TSM800C and TSM1330C displays (see pages 12 and 14), or the Maretron Black Box (MBB200C) vessel monitoring system (see page 16). If you want to run N2KView® software on your vessel's computer, you will need either a Maretron USB100 (page 28) or an IPG100 (page 30), which are necessary to get sensor information from the NMEA 2000® network to the computer.